We spent a week in unit 215 in March 2019. The condo was spacious, clean and well-appointed. The expansive view and sounds of the ocean made for a great escape. We enjoyed the little beach adjoining the condo complex where green sea turtles often came up in the afternoon to bask in the sun . Great location near shopping and restaurants, some within walking distance. Valerie at the front desk was very helpful. We have already made reservations to return next year. Second time at Hale Kai! Just finished a 1 week stay at Hale Kai in unit #215. This was a sisters trip with our husbands and we each had our own unit. Unit was clean and was well stocked with all the kitchen items you needed for meal times. Beach towels and bathroom towels were available for our use and the king size bed with quality sheets made for a comfy night sleep. We love the low-vibe feeling of this complex with its many residents and guest with extended stays. Sunset provided a get together at poolside every evening for conch blowing. The pool was perfect size, never crowded but a bit chilly due to the cool weather Maui was experiencing. Valerie in the office continues to be an awesome asset to the property answering all questions, making recommendations for restaurants and outings and even fixed our TV when the cable went out! 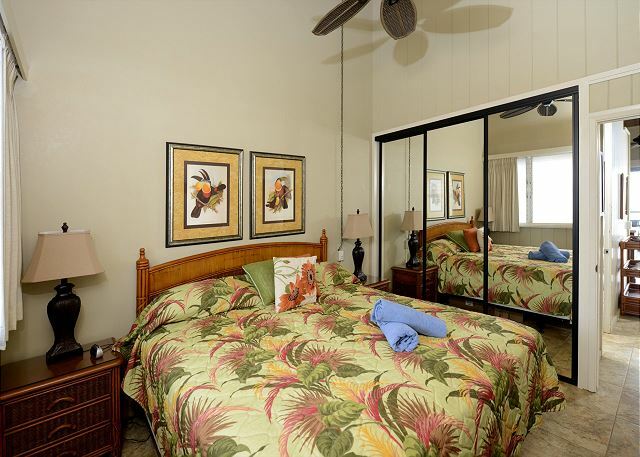 The property is lovely with views of Lanai and Molokai, whales, and an occasional sea turtle. We love this property and hope to visit again soon! We walked the neighborhood every morning and enjoyed the Farmers Market, Bad *** Coffee, the food service at ABC store, Ohana Taco's and the Fish Market. Always a delight to return each year. My husband and I had a wonderful stay in unit 215 for 8 nights in December 2018. We were especially pleased with the perfectly appointed kitchen, large comfy bed, and gorgeous shower perfect for cleaning up after a day at the beach. The location of this complex is ideal, we swam with turtles right in front of our condo! Great restaurants, grocery stores, and everything you may need are moments away. Our only suggestion would be a deep cleaning. Don’t get me wrong, the unit is clean, but a good scrub in the corners with a little elbow grease would make this spot that much more amazing. Perfect 10 day get away. Condo had everything, updates since we stayed a few years ago are well done and most appreciated.Nice to have tile flooring. So happy my grandparents discovered Hale Kai in 1978, we love coming back to this complex. You are within walking distance to everything and there is a beach right next door. We will be back. This is the 25th year visiting Maui and have stayed at many places on the west side of Maui,Hale Kai is best of all, the only issue we had was that the tile floors need to be cleaned. We were only in Maui for three nights and so appreciative that we were accommodated since the minimum stay is usually 5 nights. The condo was very clean and nice- has everything you would need. Pool was lovely and location is close to stores, restaurants, etc. This unit has the bedroom window facing the parking lot and the street and unfortunately during our stay seemed very loud. The weather was quite warm so we kept the windows open, needless-to-say, sleep wasn't good. We did not spend much time there because we were out and about so all in all it was fine. Unit #215 at the Hale Kai was impeccable. 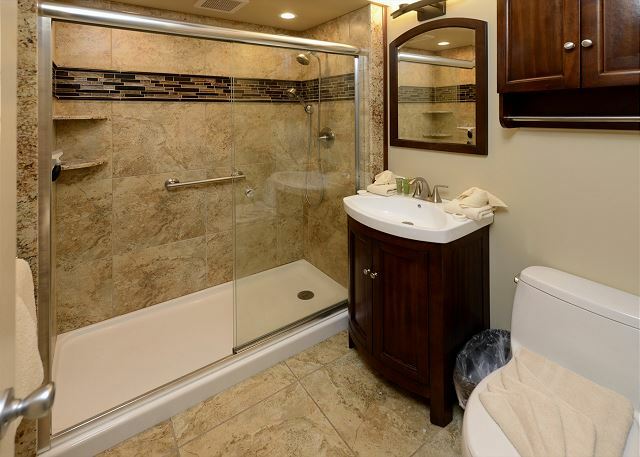 Excellent upgrades in lighting,fans,and bathroom was clearly evident. King bed was very comfortable. We had a wonderful time. 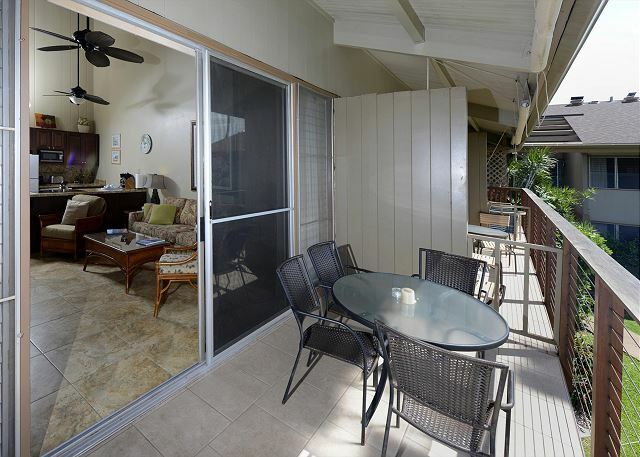 As a mahalo to the owner, we left two beech chairs in the closet for future guests. We love it here. We have been coming for 14 years. Quiet, friendly and peaceful. Good fo rthe soul. The Hale Kai has been our winter destination for 14 years. We have stayed in Unit 215 for most of that time. The upgrades to the bedroom, the kitchen and the bathroom have been wonderful. We have been unhappy for some time with the living room furniture. It is uncomfortable! There is not a comfortable chair and a larger, clearer television is needed to make this unit excellent. I was a great location with a fantastic view. Ocean front condos was a very nice place to stay, clean n had everything we needed as if it were our own home. The staff was very accommodating n where able to held with excursions we needed to plan. Although we've been coming to the Hale Kai for years, this was our first visit in October, and our first staycation, as we're currently living in Kihei. We were here 5 days, and our first and last day saw good weather, but the second night we experienced an electrical storm that went on for hours and shut power down throughout the island. That lasted until 11AM the next day, but we made it work. The unit was very well equipped (loved the sharp knives, thank you!) and the office staff was welcoming as always (Valarie is a dear!). It's doubtful we'll come in October again, but the weather was likely an aberration. Nicely remodeled and very comfortable stay. This condo is very well-appointed and really is even nicer than the photos! No A/C but the trade winds kept it comfortable. Right smack on the ocean, nice quiet and friendly complex. The office manager, Valerie, is an absolutely lovely person. I'd definitely stay here again! Hale Kai - No Ka Oi. Back for stay number 10, another 10 friends from Czech Republic visited, based on my recommendation. We come for at least 2 weeks, because of the travel time. Valerie, the property manager is the best, I know her for 10 years. This was our 5th or 6th stay in unit 215; our 9th year at Hale Kai. Hale Kai is in a terrific location. Eating our meals on the lanai to watch for whales, flying fish, sea turtles, etc., is a joy. Kudos to the new owners on the remodel! Now it's beautiful and the kitchen is beyond functional - we look forward to seeing the new bathroom next year! Instead of a kayak whale watching tour, this year we chose to go with Ali'i Maui Outrigger Canoes. It was an awesome experience - something we plan to do again next year. We have stayed at the Hale Kai for the last 13yrs. It is a beautiful, peaceful, and wonderful. We look forward to next years stay in as well. We have enjoyed the Hale Kai experience for 12 years. This is a PERFECT place to experience the beauty of Maui, the peacefulness of the ocean and the glory of the mountains and the neighboring islands. We would choose to go nowhere else. Let's be clear about this. For location, price, view, old school Hawaiian feel, you will not find a better spot on the island than the Halekai. We were 3 golfers on Mauí one week. We were very happy with this place !!! Always ready to come again. We had a wonderful time and stay. Been doing this for at least 20 years. Room has not been updated as some of the other had, but basic OK. Understand upgrade will be soon. Laundry great simple and reasonable. Pool enjoyable. Year after year we return to Hale Kai to spend our vacation on Maui. 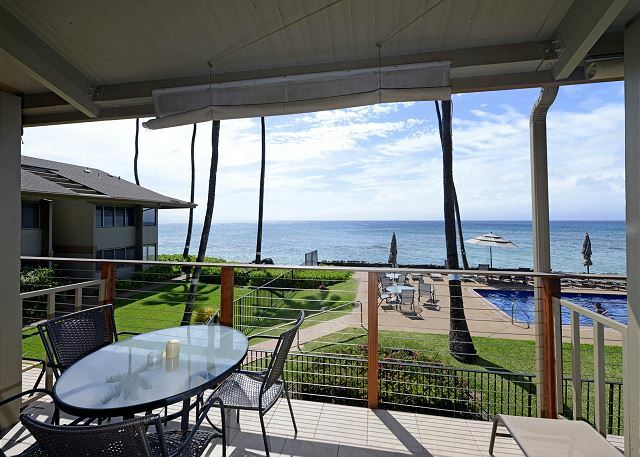 Hale Kai is a serene and quiet location, nestled in Honokowai. The units are always clean and comfortable. We are always greeted by name and there is a sense of ease and comfort while we are staying there. property MANAGEMENT WAS ESPECIALLY HELPFUL TO ACCOMMODATE GUEST WITH SPECIAL NEEDS. On the ocean. Watch the whales. We had a great time. Hale Kai is privately owned with an on-site management company, that is great to deal with. The wonderful thing about the proximity to the ocean is being able to watch the whales in the channel, and the sea turtles on the beach at the location. The view is exceptional. The entire complex is well maintained an clean. The entire setting is excellent. We recommend the place to all our friends. We have been coming to the Hale Kai for 10 years now. No place we would rather stay. Peaceful, quiet and the view is awesome. Great, the dishwasher and toaster both broken and living room fan wouldn't go above low, but overall great place great view and great neighbors. We loved our stay in # 215. It was very clean with new carpet and new couch. Wonderful views of Lanai and Molakai from the back deck along with turtles swimming in the surf. Beautiful park next door. Great Farmer's Market 1 block away. Valerie the manager very attentive to our needs and questions. Pricing of unit very reasonable, we shopped around. The Hale Kai complex has a small, intimate "Old Hawaii" feel, which is really nice and homey. Parking is easy, and many stores and restaurants are within walking distance. We stayed in unit 215, which has a gorgeous view of the ocean and Molokai. The sunsets are amazing! The unit itself is in serious need of remodeling, updating and cleaning. Also, there is no air conditioning, and in June the heat was sweltering. I would never go back there during the summer because of this issue. Overall, this unit has a great view and the complex is in a good location. Just keep the other issues in mind before booking a stay here! we have been staying at the Hale Kai since 1978 - wouldn't stay anywhere else. It is home away from home and we love it there. Great Ocean View of Whales ! Great view with close proximity to Lahina. Not a lot of privacy with Venetian windows. We had a lovely stay at Hale Kai and cannot wait to go back! The condo office was very nice and helpful, and we loved that there were laundry facilities available (we didn't need them, so I can't comment but did notice the machines were coin operated). The location was perfect! Directly next to a park with a great playground and beach, plus a little shopping plaza (with farmers market, store, coffee place, etc) a block away! We spent a lot of time at the park with our 1.5 year old and the farmers market had great produce! We loved that the condo had a pool (it was our daughter's first time at a beach and we weren't sure how she'd like it) and nice beach to the north and south. We spent more time at the park's beach, since the water was a little gentler. We stayed in #215 and thought it was perfect for our needs. One bedroom with a king bed, living room, kitchen, and bathroom. Each unit is individually owned, so they're all a little different (the pictures on the website were accurate). This was not the fanciest, most upgraded condo, but it worked great. You couldn't beat the view! 215 faced the ocean and felt like we were basically in it... Sitting on the lanai was a great time and we saw multiple humpback whales! There was no air conditioning, but we didn't really miss it (during my research, it seemed like AC is somewhat rare due to high energy costs). Between the fans and the winds, the condo was kept plenty cool (although as Alaska residents, we would have definitely used a window AC unit to keep the bedroom a touch cooler at night). 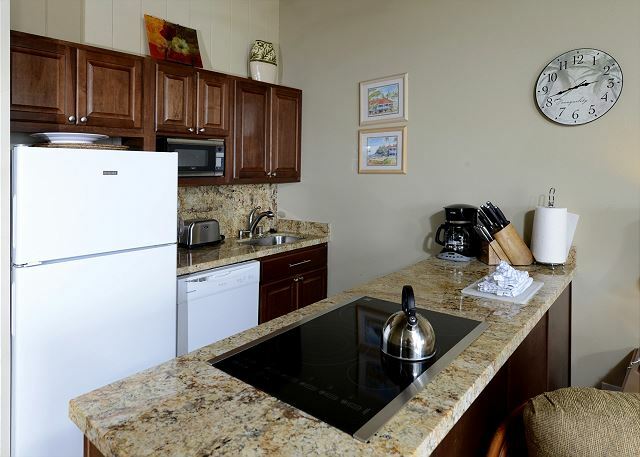 The kitchen was well equipped, and we used the coffee maker, blender, and dishwasher a lot. The only things missed was some Tupperware -- it would have made packing lunches for the beach easier. We initially thought the shower only would be an inconvenience with the baby, but it ended up being perfect! We would have had to fill a tub twice for proper sand removal and washing. Loved the room we stayed in at Hale Kai. The view to the ocean never got old...Would love to stay there again. We were very satisfied with our experience. Wonderful location. Rental was in need of a thorough cleaning and was a little worn but otherwise absolutely no complaints. Cannot beat the view from your balcony. This was our 2nd stay at Hale Kai Condos and 1st in #215. 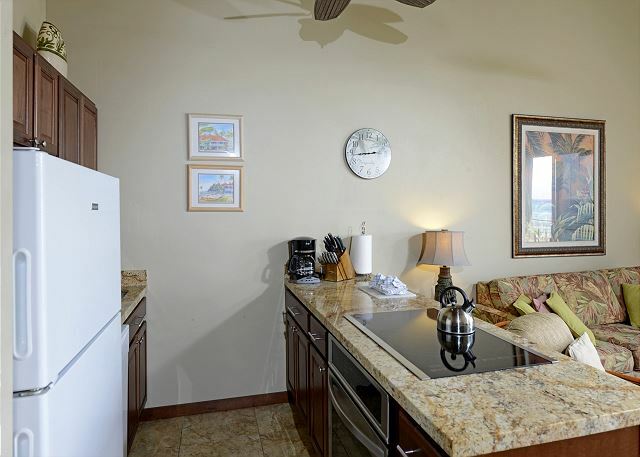 The condo was clean, well equipped and maintained and offered great views on the ocean. We definitely will come back. With so many highly rated take-out restaurants within walking distance no need for a car at Hale Kai if you want to really rest. With green turtles on the reefs just off shore and the symphony of conch shell blowers around the pool at sunset there is always something happening. And Valerie and her staff are so helpful and quick to provide any missing items or fix problems..... wonderful. Guests respect the quiet time rules - the ever present sound of the ocean makes sleeping easy. 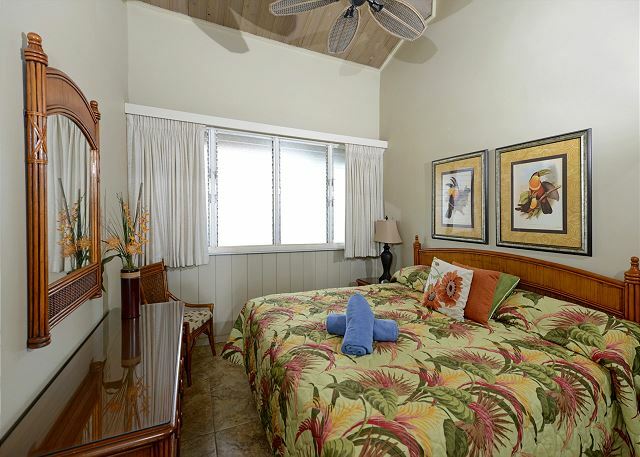 The property is aging and some units could use an update, but overall it is a great place to spend time on Maui. What a wonderful place to come! Hale Kai is a terrific place to spend time on Maui. It is right on the beach with no filtered views. It is so nice to listen to the ocean waves at night, then awake to have coffee on the lanai while watching the whales leaping from the ocean in the channel in front of you. From the ocean view room we stayed in you have an unobstructed view of both Molokai and Lanai across the channel. The room was terrific and well equipped, the staff was really friendly, pleasant and helpful, and the facility was kept clean and well cared for. There is a fun, inviting attitude amongst those staying there and the other visitors all make everyone feel like friends and family. As opposed to other complexes, Hale Kai is right on the ocean with swimming available in either the ocean or the beautiful ocean-front pool. It's not walking distance from the beach. It is part of the beach. Stores are available very close, many within walking distance. The Hale Kai is definitely on our list of places to return to. It's our Hawaii destination. After our eleventh year at the Hale Kai we continue to love our time there. All those employed go out of their way to be kind and helpful. We are grateful to each of them. It's hard to leave but look forward to the next visit! We thoroughly enjoyed our stay at Hale Kai unit 215. 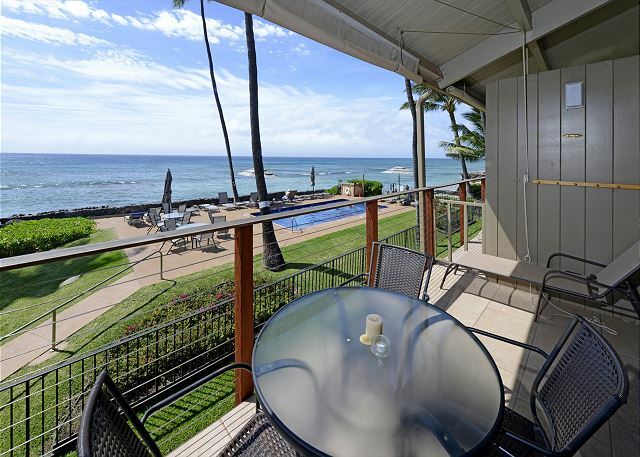 This unit has great views of ocean Molokai, Lanai, sunsets, whales, pool--couldn't be better in that regard. The interior could use some updating, but was clean, comfortable, and met our needs for a reasonably priced, low key stay. My family and I had a great time. We'll be back. We found the property and location a great value. The views from the lanai were exceptional. Our apartment was clean and well stocked for our stay. Management was incredibly helpfull in accomadating our needs. We have visited Maui before for a day off-ship, but this was our first one-week condo stay. For us, Hale Kai is the ideal combination of great location, nice facilities, nearby necessities and fair price. Unit 215 is a step back into 1970's island deco, but that was just fine with us. The unit is stocked with everything you could possibly need or expect and the complex is very near markets and restaurants. The lanai view of 180 degree sunset and across the channel to Molokai, is fantastic. Owners and long-time repeat guests were very friendly to us first-timers. Thank you. Great pool and sandy beach are right there. We will book again for sure. Our only suggestion is to rough up the dangerously slippery last step onto the sandy beach. You are begging for a lawsuit from a crazy who slips and is injured despite the easy to read, well-placed signs warning of the slippery steps. We had a fantastic vacation while staying at Hale Kai. Our favorite part about staying here was being a stone's throw from the ocean! Seeing the beautiful sunsets at night, hearing the waves, and seeing the green sea turtles made it even more memorable. Condo floors could be cleaner. We have stayed in this property 8 to 10 times in the last 25 years. Noise at night has always been an issue at times. People downstairs do not realize how noise carries out the bed room windows and upstairs. I had to go down stairs one night and tell the occupants to turn the sound down on their computer. My suggestion is a notice in the bedrooms on the wall a nice reminder that voices and noise carries upstairs. Older building in a well kept, convenient location. Fantastic view. Condo needed updating (bathroom,kitchen floor,appliances, decor). Everything was just adequate. Street traffic noise was loud until midnight or so. Beach park, next door, was disappointingly rocky with the reef too close to shore. The view makes up for all other shortcomings. Spectacular. Would stay here again but not in this unit. We had a great vacation. The condo at Hale Kai was amazing. It was right on the beach, and had a pool as well. We took advantage of the bbq pits several of the nights we were there. Everyone at the Hale Kai, staff, residents and other guests were all very friendly and made the stay that much better. I would recommend this place to anyone! The condos were very convenient to a good coffee shop, small good restaurants and farmers market. 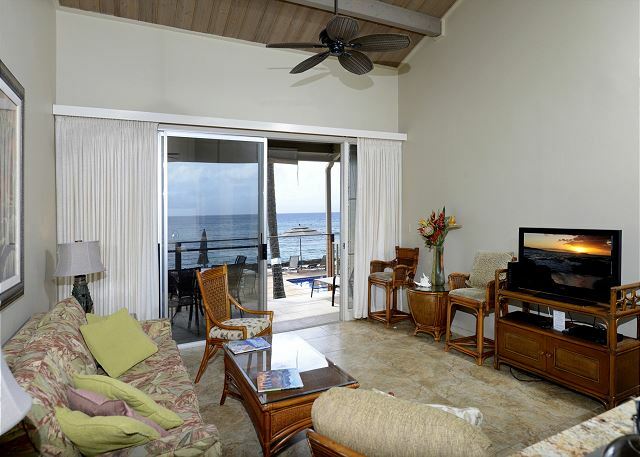 In addition they were situated right on the ocean front with nice pool and barbeque area. One hour drive from the airport and close to entertainment areas. Great vacation stay. As always the Hale Kai was a wonderful experience. The new railings looked great. The flowers on the grounds were beautiful. It was very relaxing. Many good memories...AGAIN! No better place to be. We have been coming here for the past two years and love it! Valerie the manager is so nice, and the grounds are kept immaculate. It has a nice low key vibe. Thanks Valerie! We have been to the Hale Kai ten years in a row and find our stay to always be a blessing. The view is magnificent, the unit perfectly located, the professional staff always willing to take care of our desires. What a tremendous new king size bed. One could not wish for a better seven week home in the midst of winter weather. We thank everyone (Valerie, Moose and Gabby) and our friends for making our stay always a good memory. change the box spring & mattress the current offering was back ache city after 2 days. A King would be nice. Dust artificial plants - no beefs except the bed. Perfect. Love that it is not a resort. Its quiet, homey, updated, adorable..condos have vaulted ceilings, kitchen with all the amenities, view was to die for, pool was impeccable, neighbors were chill. Just all around great vibes, everything you need. Could totally live here. One of those places you'd rather keep a secret but....gotta share the love.